TsukuBlog | Do the Shikoku Eighty-Eight Temple (O-Henro) Pilgrimage Circuit- Right Here in Tsukuba! In Japan, April is a month of new beginnings and fresh endeavor, with millions of people starting out at new schools, new grades and courses, new jobs and new postings, as the academic year, as well as the fiscal year ( among other things) begin in that month. The timing seems only natural, as the cycle of rice cultivation, around which Japanese life has revolved for centuries, has traditionally begun in April, when after the cherry blossoms have fallen away, the rice seedlings are readied and the fields flooded and prepared for the transplantation which takes place in early May. And for those who are not needed in the fields, April has also been the traditional month for setting out on a pilgrimage. When most Westerners hear the word PILGRIMAGE they do not think of Japan. Mecca, Rome, Lourdes, Jerusalem or even Graceland, probably come to mind first. Japan , however, has been a land of GREAT pilgrimages, especially during the Edo Period (1600-1868), when the relative peace, prosperity and well maintained highway system achieved under Tokugawa hegemony made it possible for an unprecedented number of people to set off on religious journeys- either for penitence and merit, or just plain adventure. Whatever the real intention was, the reason (or excuse) for travelling given to neighbors, and then to the authorities at the numerous and stringent check-points was- MAKING A PIGRIMAGE. This was mainly because that was just about the only type of movement from place to place which was permitted to most ordinary citizens of Tokugawa Japan. Japanese pilgimages can actually be divided into two types, one is the SANKEI （参詣） , visits to individual sacred places, either mountains, temples or shrines (though before the Meiji Restorarion of 1868 what we now call Buddhist temples and Shinto shrines were not at all clearly distinguishable). These had been enjoyed by the aristocracy at least since the Nara Period, and always made a good excuse for an exciting excursion away from the cloistered confines of the Court. In the Edo period, the old highways (kaido), especially the famed Tokkaido, were usually lined back to back with pilgrims (mostly revellers, in fact), who walked for weeks (almost no commoners had permission to ride a horse or in a palanquin), partying most of the way, until they reached the Grand Shrine at Ise (Mie Prefecture), where they partied some more before heading (and partying all the way) home. For a hilarious account of a pilgrimage to Ise (Ise-Mairi), read the Tokkaido-Chu Hizakurige (translated into English as Shanks Mare) by the great Edo Period writer Jippensha Ikku. It will have you laughing out loud and give you plenty of insights into what life was like of the road in those days. 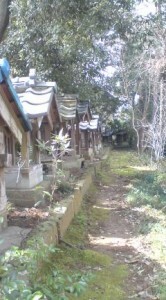 The second type of pilgrimage, referred to using the Japanese word JUNREI (巡礼）, consists of doing a full circuit and visiting a complete grouping of specific temples, often in a set order. This was ostensibly a much more serious and solemn affair, a rite of passage of sorts, with the pilgrims donning special wear and gear, and journeying for days, weeks or months in straw sandals, with asceticisms, repentance and the gaining of merit in mind. Though there are several pilgrimage circuits which remain popular to this day, undoubtebly the most famous is the 88 temple circuit of Shikoku. In this major undertaking, pilgrims called O-Henro set out on an arduous 1000 km journey which takes about two months to complete on foot (though now it can be done by car or bus tour). 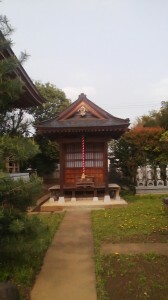 The temples visited along the way are places at which the great priest Kukai had supposedly done asceticisms at ( the number 88 represents the number of worldly evils designated by Kukai and a visit to all the temples is believed by some to be a major step in suppressing these evil urges). Tofuku-Ji (founded in 1253), is one of Tsukuba`s most interesting temples and the base for one of the Kanto area`s thriving mini-pilgrimages. It begins each year on March 30th and lasts for 10 days. For many Japanese, especially those who had retired from their trades or were too old too help with the farming, completing the Shikoku Temple circuit was something spiritual to aspire to once in a lifetime. April was the time of year, when most O-Henro set off on their long JUNREI. As you can imagine, though, for various reasons, most people could not get away from their families and villages to make the trip to far off Shikoku. That is why in many parts of Japan, including Ibaraki Prefecture and even in Tsukuba itself, there are places where anyone can become an O-Henro SYMBOLICALLY. These mini-pilgrimages are called Shin Shikoku Hachijuhachi Kasho Junrei ( 新四国八十八ヵ所の巡礼ーNew Shikoku 88 Sacred Site Pilgrimage). 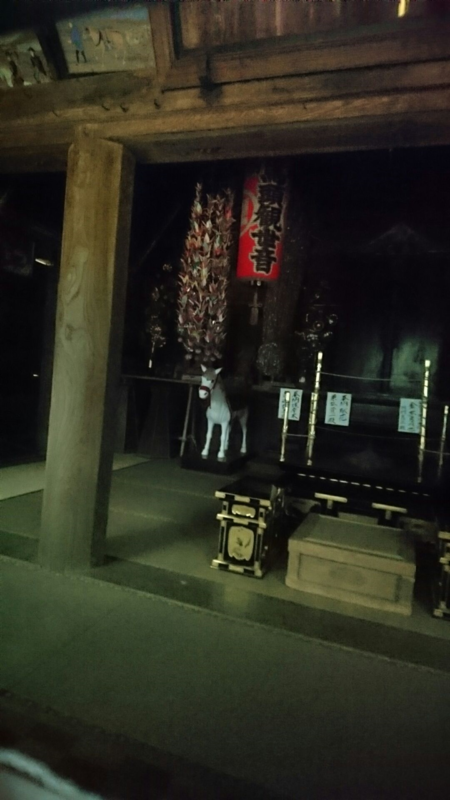 One place in Ibaraki where this type of pilgrimage takes place is in Azuma-Mura in Inashiki City. In April, senior citizens can be seen in white pilgrims-wear, travelling by bicycle or on foot, visiting the 88 small halls or temples which represent the sacred Shikoku sites. This could take a week or more! This pilgrimage begins at Azuma-Mura`s Shomei-In Temple (照明院), and ends back in the same village`s Mangan-Ji Temple (満願寺). Along the way, local residents have traditionally provided refreshments for the pilgrims along with words of encouragement. Unfortunately, as time goes by, and with the passing of the older generation, fewer and fewer people are joining in on this symbolic journey to Shikoku. In Tsukuba , however a similar mini-pilgrimage is still going strong long after it was first started by a priest of the Tofuku-Ji Temple (東福寺) back in the 1840`s. Having undertaken the Shikoku Pilgrimage several times himself, the priest thought it would be nice if the people who lived in his home region and couldn`t get away, had a chance to be O-Henro . 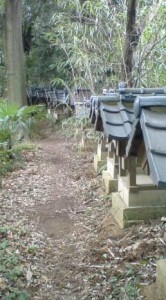 What he did was gather soil from each of the temples on the Shikoku Circuit and put them in pouches. When he came back to his own temple ( now part of Tsukuba City) he created a course of his own design by depositing the little packets of soil at various temples in an area ranging from what is now Tsuchiura City, all the way to Hojo, at the foot of Mt. Tsukuba. The main hall of the To-fuku ji Temple in Matsuzuka, Tsukuba. 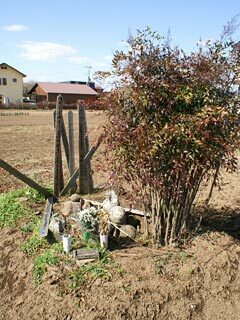 Nyozo-ni (Takiyamori Hime), the daughter of rebel warrior Taira no Masakado is said to have lived out her life here as a nun, praying to console her father`s spirit. Every year, to this day, this pilgrimage is undertaken over a period of ten days ( beginning on March 30th) by groups which this year ranged from between forty to twenty people wearing traditional pilgrim garb ( though each day they set out from the Tofuku-Ji Temple by car to the neighborhood that they will walk around ). 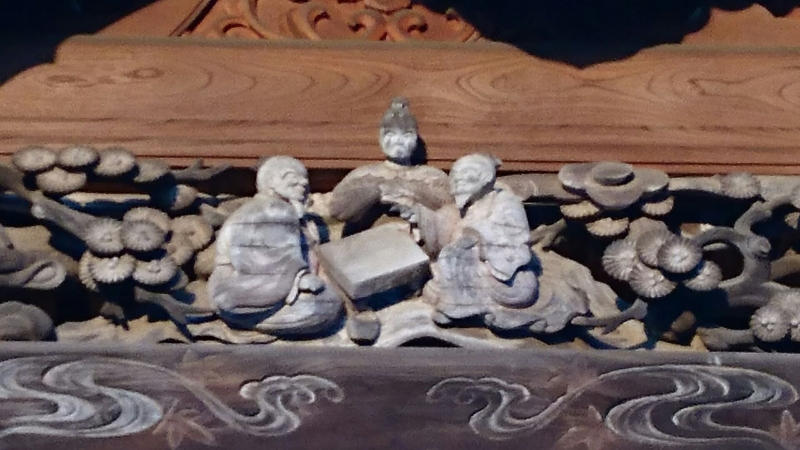 Carvings of Go players on the main hall of the To-fuku ji Temple. On a much smaller scale, and accessible throughout the year, there is the super-mini pilgrimage at the Nichirinji (日輪寺)Temple in Konda, which happens to be one of my all-time favorite places in Tsukuba. 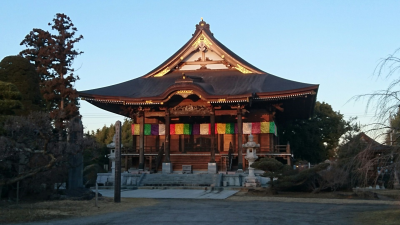 This Shingon Sect Temple (one of nine such temples in the old Sakura Mura part of Tsukuba City) was originally established in 1140 by the Oda Clan, who once ruled this area. 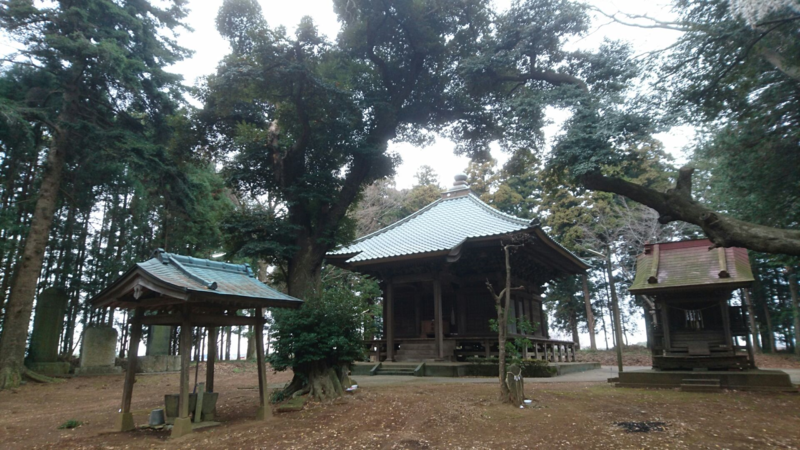 It was first intended as that family`s personal temple and it stood for centuries half-way up Mt Oda near Mt Tsukuba, until it was moved in 1531 to its present location in Konda, on the site of what was probably an outer fortress of Oda Castle (the old moat can still be seen! ), during the battles which raged in the Period of Civil War. The Oda Clan was eventually destroyed. During the Edo Period, when the country was stable and at peace, Nichirinji flourished at its new location, gaining recognition from the Shogunate and the Imperial Court and amassing extensive holdings in the surrounding area. This all came to an end, however, with the Meiji Restoration of 1868 and the subsequent persecution of Buddhism which came to be seen as an ALIEN CONTINENTAL INFLUENCE. For about four years Nichirinji was virtually abandoned and lost much of its holdings. In the 4th year of Meiji (1872), however, its priest made very active efforts to revitalize the venerable temple. 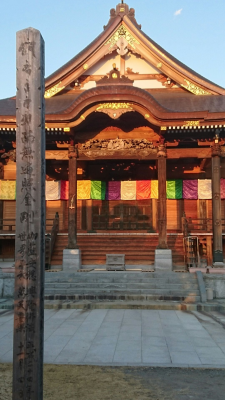 This included the creation of 88 small halls, each representing on of the temple of the Shikoku Pilgrimage. In past years this was a popular thing to do. 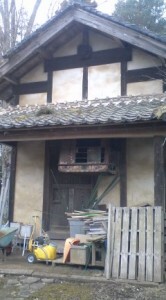 These days, however, the wooden structures seem to be all but abandoned . Vegetation can be seen growing inside them, obscuring the carved images of Kukai, the founder of the Shikoku pilgrimage Circuit, found in each one . This creates a melancholy, though highly photogenic scene.As you walk around the verdant pilgrimage path you will also come to a giant momi (fir) tree, which is truly magnificent. For me this tree alone makes a visit to this temple well worthwhile. 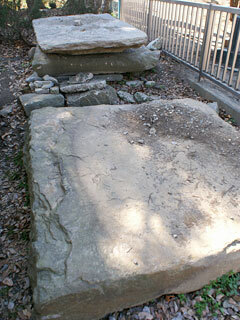 There are also plenty of sacred stones and other things of interest within the temples precincts. Look for the old rundown palanquin (the former priests of this temple were actually granted permission to ride in one-thats how prestigious it was!) When you get to the small wash basin, check out the ceiling of the small canopy which covers it. 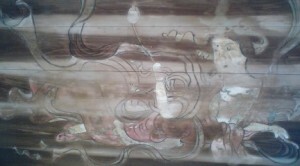 There is an interesting and very faded painting of a TENNYO celestial maiden on it. Pilgrimages have had a tremendous impact on the evolution of Japanese culture, and the forms and patterns adopted by the earlier generations of Japanese travellers remain clearly and uncannily recognizable in contemporary Japan. When I see bus loads of japanese tourists being run around to as many as possible of the noteworthy sites in a particular city or country, and with these tourists having a quick look around before having a photo of themselves snapped to commemorate the event, before rushing off to the next site, I cannot help but imagine pilgrims on a JUNREI, trying to visit all the temples in the circuit, not wasting any time at any particular one, getting the temple`s stamp in their stamp book as proof that they had really been there and then heading off for the next temple on the circuit. And lets not forget picking up souvenirs for all the neighbors back home (who in the old days might actually have contributed some money to support their fellow villagers pilgrimage). Reading over these last words, I am reminded of an interesting story. A few years back I lead a group of women from rural Tsukuba, all of them grandmothers, on a five day tour of NY City. It was all an amazing experience, but what sticks in my mind most was how, at JFK airport, waiting for our flight back to Japan, our oldest (at 85) and dearest member- Toshiko, bought about fifty boxes of highly over-priced chocolates with a picture of the Manhattan skyline on their boxes, for each of the families in her neighborhood. The cost of these OMIAGE was certainly more than that of our entire trip, but that is what has been done for centuries. When a person went off on a pilgrimage they always came back with the famous souvenirs of the places they had visited. Of course you should try to make it to Shikoku. 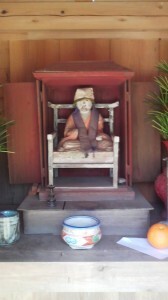 But if you can`t, there is always Nichirin-Ji. 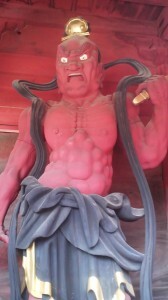 When visitng the Tofuku-Ji Temple don`t forget to have a good look at the Nio guardian deity sculptures housed in the gate to the right of the main hall. These were rescused from the old Chuzen-Ji Temple on Mt Tsukuba (where the Mt Tsukuba Shrine now stands) when fanatics burned were destroying any vestiges of Buddhism on the mountain. 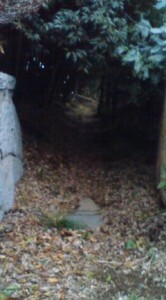 This mound in the middle of a field 200 to the west of the temple is the more likely grave-site of Takiyamori Hime (since the one pictures above is most probably from a much earlier period). 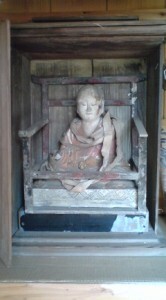 Her name (around To-fuk ji people refer to her as Takiyamori Hime and not Nyozo-ni) is written on the wooden TOBA slabs, indicating that the local people still remember her. The Hanare Kannon (羽成観音) in Yatabe, Tsukuba, has a mini-pilgrimage of its own. It begins on April 1st and runs through the 10th. This temple was founded by the Lord of Ushiku Castle Yura Kunishige (由良国繁) in 1592 as one of eight Kannon Halls (and seven Yakushi Halls) he creating to console the spirits of the men from the Okami Clan who`d fallen in a battle that took place near Yatabe. Pilgrim and Omiyage, Ha-Ha-Ha! I got that exact DNA from my ancestors. When I and my wife made trips to overseas or some Onsens in Japan, we usually bought more than 8 boxes of sweets for our club-mates, always say something Bustu-Butsu (complain). After we accomplished holly duty of buying suitable Omiyages then we could relax and could enjoy trips from bottom of hearts!!?? Oh I love that old palanquin!! Must find some volunteers to load 68kg plus Omiyages. There is another mini-pilgrimage held in Tsukuba every year – one that I had never heard of before this year. 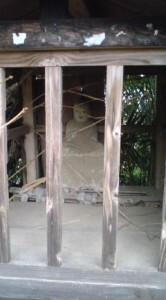 It begins on April first at the Hanare Kannon, Kannon-dai Yatabe. and runs for 10 day. That means the pilgrims will be visiting about 9 temples and Daishi halls per day mostly in western Tsukuba (staying out of the territory covered by the Tofuku ji Pilgrimage!